Welcome to the December issue of MEA Markets Magazine, your source for the latest news, deals and developments across the Middle East and Africa region. In recent news, the global OTT leader for South-Asian entertainment, YuppTV has roped in Rajesh Iyer, Executive Vice President and Business Head, & TV – ZEEL Group as the Chief Operating Officer for APAC and Middle East. Rajesh will take charge of his new role from January 2018 onwards. 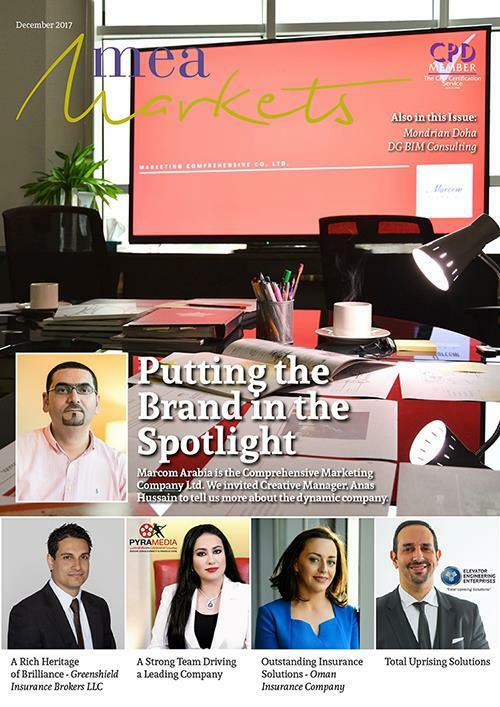 In this month’s issue, we discover more about Marcom Arabia, which was established in 1999 to build business to business databases for some international companies such as, Microsoft and Intel, and utilizing these databases in direct marketing activities such as direct mailers, email newsletters and fax campaigns. Taking time to tell us more about the company is Creative Manager, Anas Hussain who explains how both Marcom Arabia and the services have grown, and the types of clients with whom they work with. Also in this edition, Greenshield Insurance Brokers is a Dubai based insurance broking firm, and is a family run operation, holding values similar to its parent company; integrity, honesty and social responsibility, all of which are central to its mission. We learn more about the business when we sat down with the firm’s Deputy CEO, Rahul Roy who discussed with us the inner workings of Greenshield Insurance Brokers. Lastly, Oman Insurance Company (OIC) is one of the leading insurance solution providers in the Middle East headquartered in Dubai, UAE. Recently we spoke to Louise O’Donnell who told us more about the region, as she features as Most Trusted Executive Vice President (Head of Internal Audit) for Providing Outstanding Business Services in the United Arab Emirates. Here at MEA Markets, we hope you thoroughly enjoy reading this edition and look forward to hearing from you.